Hold on to your globes, he’s back!! HA — that’s pretty perfect! 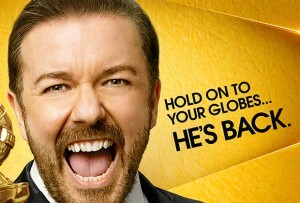 I’m so excited to allow myself to immerse in the complete and utter ridiculousness of the Golden Globes tonight! I LOVE the red carpet! I LOVE Ricky Gervais! OMG, it’s like a roast – inside of an award show – inside of a comedy club! Bring it on Ricky! I also LOVE the movies and the shows. I hope Outlander wins! So, bring it on. I can’t wait. Don’t call me tonight. I’m busy. D.o.i.n.g. – A.B.S.O.L.U.T.E.L.Y N.O.T.H.I.N.G!